After getting back from bootcamp, I had the best intentions to get back on track with my blogging. I had loads of posts lined up and somewhere between getting settling back into work and catching up with friends, I just never really got around to it.. Anyway, one of the things I wanted to share was that just before I packed myself off to Norfolk last weekend, I attended the lovely Anna‘s Distinctly British supperclub. And really, there’s nothing like gourmet dinner to prepare you for a weekend of health food and fitness..
Held in Ouse Streets Arts Club, a couple of shipping containers in the Ouseburn Valley made cosy with retro furniture and a wood-burning stove, Anna’s supperclubs are a chance to enjoy amazing food and meet interesting new people. Steadily growing in popularity, Anna announces the supperclub online and all you need to do is reserve your place. It’s a bring your own bottle policy and at the end of the meal you’re given an envelope to donate however much you felt the evening is worth. Having heard great things about the last few, I really couldn’t wait for the next one to come around! So of course, as soon as she emailed, I quickly reserved a couple of places and dragged Lucy along with me. Since I was heading down to Norfolk and had to be up at 5am, I didn’t get to enjoy any of the gin cocktails offered as we arrived but I still had a fab night. 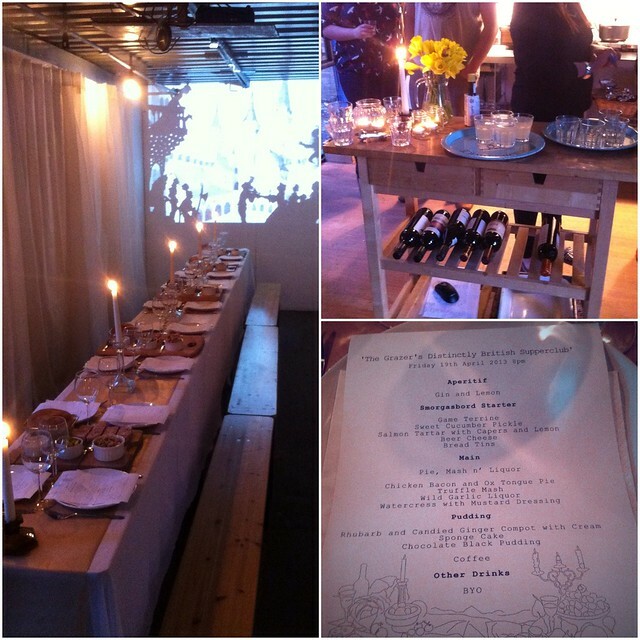 With Lotte Reiniger’s shadow show Fairy Tales being projected onto the wall, and soft lighting from the candles, the supperclubs are an elegant gathering where like-minded people can enjoy good conversation and food. Once we had finished our introductory drinks we were all seated at a thin wooden table. 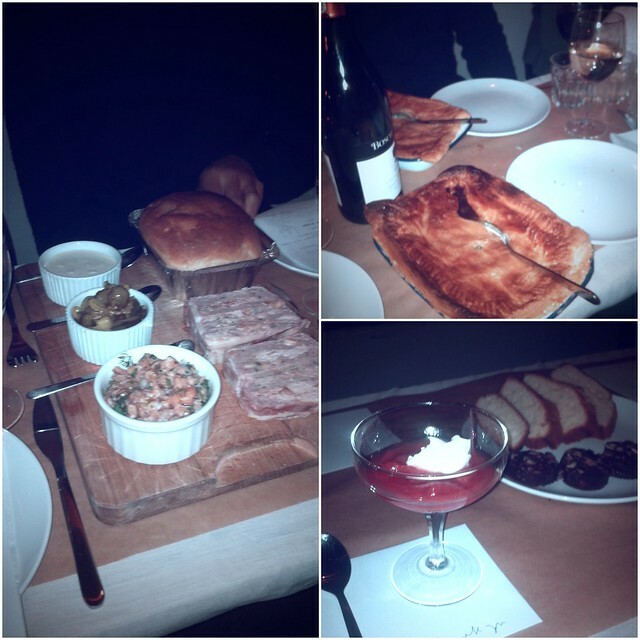 To begin with we tucked into a smorgasbord of game terrine, beer cheese, salmon tartar, sweet cucumber pickle and fresh bread. For the main course we enjoyed chicken, bacon and ox tongue pie accompanied by truffle mash, and wild garlic liquor. I’ve never tried ox tongue before and I’m not usually the biggest fan of pastry but the pie was amazing: perfectly cooked with a surprising light and very moreish, crumbly pastry. To finish we enjoyed coffees from Ouseburn Coffee Co, perfectly fluffy sponge, chocolate black pudding and a deliciously tart rhubarb compote with cream. Catching up with Anna after we’d finished our meal (mainly to gush about how amazing everything was), we found out that this supperclub had booked up in record time so if you’re wanting to attend the next one, then be sure to get your name down quickly! I know I definitely will be. Previous Post Back to blogging..